A Brief Look at The New American Standard Bible (NASB). 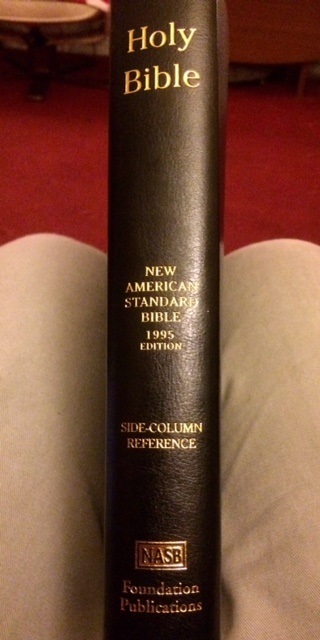 The author’s copy of the NASB Bible(1995 edition). For I delivered to you as of first importance what I also received, that Christ died for our sins according to the Scriptures, and that He was buried, and that He was raised on the third day according to the Scriptures, and that He appeared to Cephas, then to the twelve. After that He appeared to more than five hundred brethren at one time, most of whom remain until now, but some have fallen asleep; then He appeared to James, then to all the apostles; and last of all, as to one untimely born, He appeared to me also. For I am the least of the apostles, and not fit to be called an apostle, because I persecuted the church of God. But by the grace of God I am what I am, and His grace toward me did not prove vain; but I labored even more than all of them, yet not I, but the grace of God with me. Whether then it was I or they, so we preach and so you believed. Today we are fortunate to have many excellent translations of the Holy Bible in English. The highly accurate New American Standard Bible (NASB) offers its readers great ways to enrich their knowledge of the inspired word of God, with a number of unique scholarly features that highlight the challenges of translation from the original tongues, as well as revealing how the New Testament comes alive when viewed through the lens of the Old Testament. Tune in soon to find out more…………………. This entry was posted in Uncategorized by Neil English. Bookmark the permalink.